such as adding Telco or BNC connectors to a box. We will custom punch to your specifications. 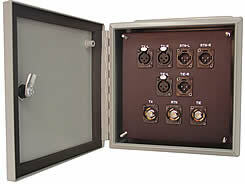 you to design boxes that wil be custom punched for you with any connectors we carry. and in other harsh enviornments. your needs, and your 19" Rack. Your imagination is the only constraint! Contact Clark for information on custom boxes built to your specifications, or use our Online Custom Design Program to design and send your custom boxes directly to Clark for a quotation.